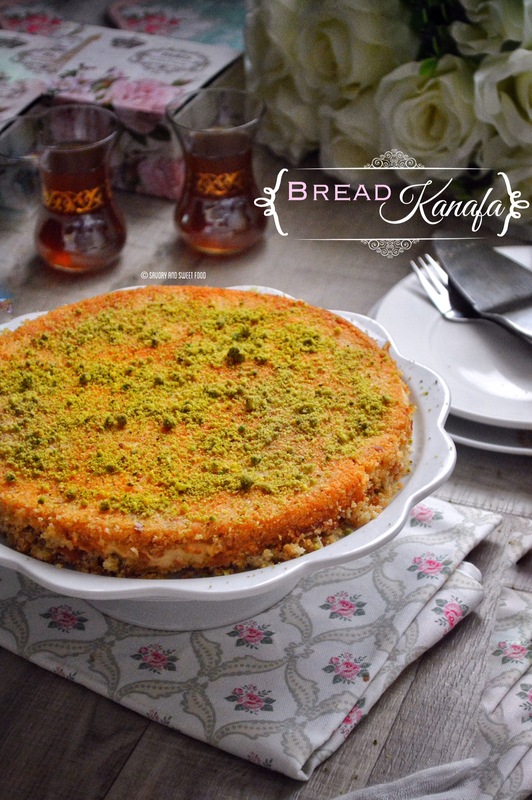 Bread Kanafa, is an easier version of the traditional kanafa. Here instead of the kanafa dough, bread crumbs are used. 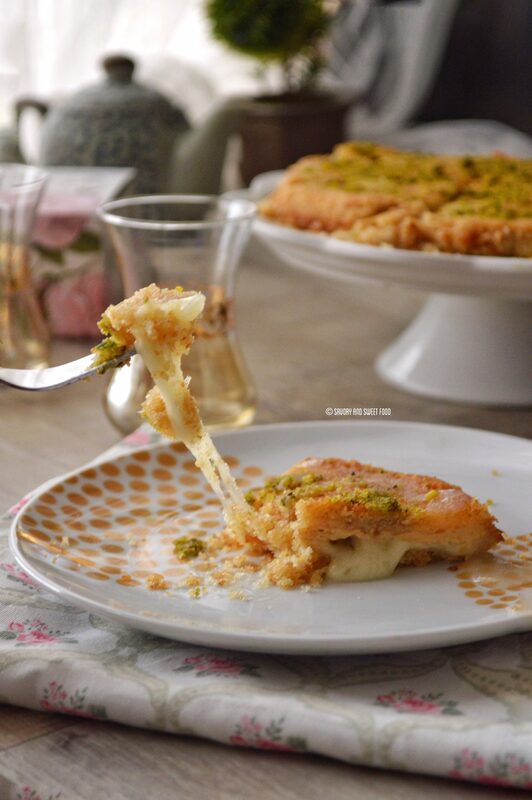 Instead of the akawi cheese, I filled the dessert with thick cream and mozzarella cheese. Bake this till golden and crisp and serve with a thick and fragrant sugar syrup and devour. Ramadan has stepped into its last ten days, the real golden days are here. I really hope I can utilise this time to the fullest, increase my duas as you know Dua is our weapon. Try to make dua even when your times are good, so that when you go through a bad time, your duas will be answered. Now to our recipe of Bread kanafa. Kanafa is a Ramadan tradition. For some reason it feels so comforting when having this dessert during iftar. Maybe its because of its light taste or maybe the sugar syrup. Hard to find out the reason, but Ramadan and Kanafa go so well together. It is very difficult to figure out when and where kanafa was originated exactly. But it looks like the entire Middle East have played a role in perfecting this ‘Queen of Arabic Desserts’. Nowadays you get a wide variety of Kanafas– Kanafa cheesecake, Chocolate Kanafa and I have even come across red velvet Kanafa. But after tasting it all I still feel the traditional Kanafa with the akawi cheese tastes the best. 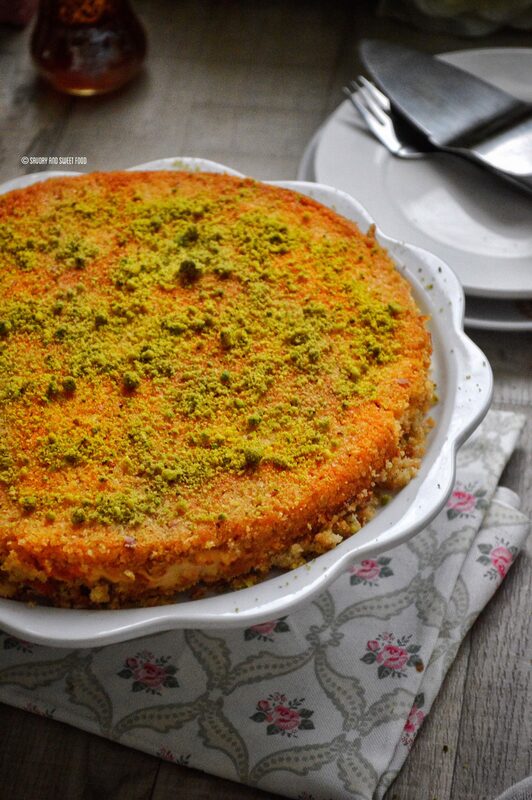 What I have for you all today is kanafa made with bread. It is too easy to prepare this and it sure does taste a lot like the traditional one. I had prepared this post some time back but I was lazy to edit the video. But I wanted to post this during Ramdan. So here is the super easy recipe along with a video. Please do watch it in HD. Hope you all like it. 🙂 Check out my old post of Kanafe Na’ame made the traditional way with kanafa dough here. This tastes best when eaten right after you take it out of the oven as the bread will be crispy. But you can have it later too. You just have to heat it a little bit so that the cheese melts. It will taste the same but the bread won’t be very crispy. Trim the sides of the bread. Process it till you get fine crumbs. Line a 9″ or 8″ baking pan with baking paper or just grease it very well with melted butter or cooking spray. Place a layer of the bread butter mixture. Spread a thin or thick layer of cream (as you like). Sprinkle shredded mozzarella all over. Place the remaining bread mix on top. Bake in the oven for 15-20 minutes on 180C or till the top and bottom becomes golden brown in color. Sprinkle ground pistachios all over. Cut it into pieces and serve. Then pour sugar syrup over it and enjoy. Serve immediately. Place the sugar and water with lemon juice in a sauce pan. On high heat stir till the sugar gets dissolved. Once it comes to a boil, reduce heat to low and simmer for not more than 10 minutes. Turn off heat and pour rose water. Line a 9" or 8" baking pan with baking paper or just grease it very well with melted butter or cooking spray. This tastes best when eaten right after you take it out of the one as the bread will be crispy. But you can have it later too. You just have to heat it a little bit so that the cheese melts. It will taste the same but the bread won’t be very crispy. Thank you soo much Shazia! Try it. 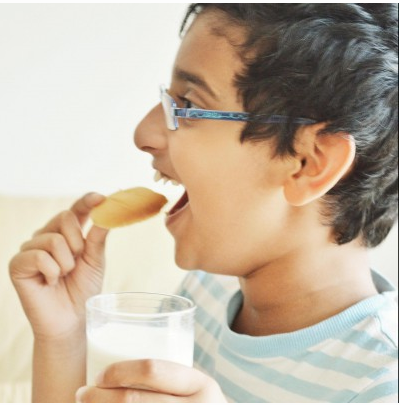 Its so easy and tastes good too. 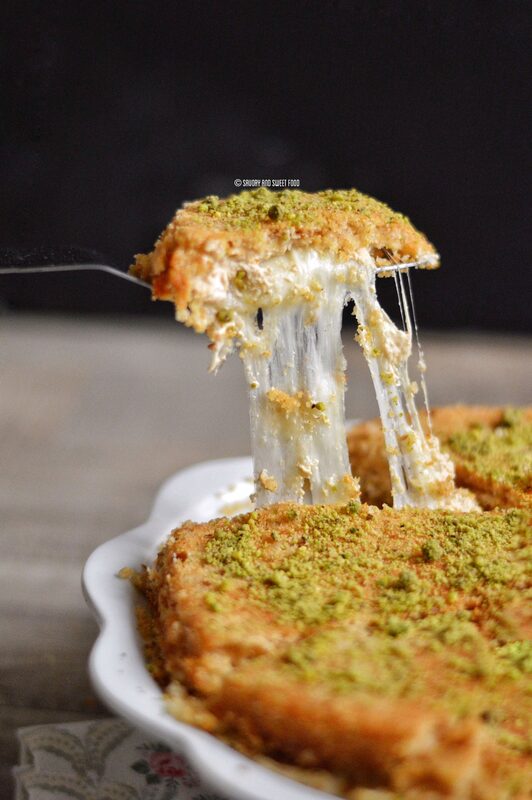 Wowwww …..i lov kunafa n ths so ec…surely gona try it soon …iA …can v use nestle cream nd approximately how many bread slices wud v need? Heyy Shinaz! Thank you! Long time. Yeah you can use nestle cream too. But puck or kdd thick cream is the best for this. You will need one full bag of sliced bread for this. shinaz that would be around 15-16 slices of bread. Is the orange blossom a necessity? I don’t have any. Nope, it’s optional. Just use the rose water alone. 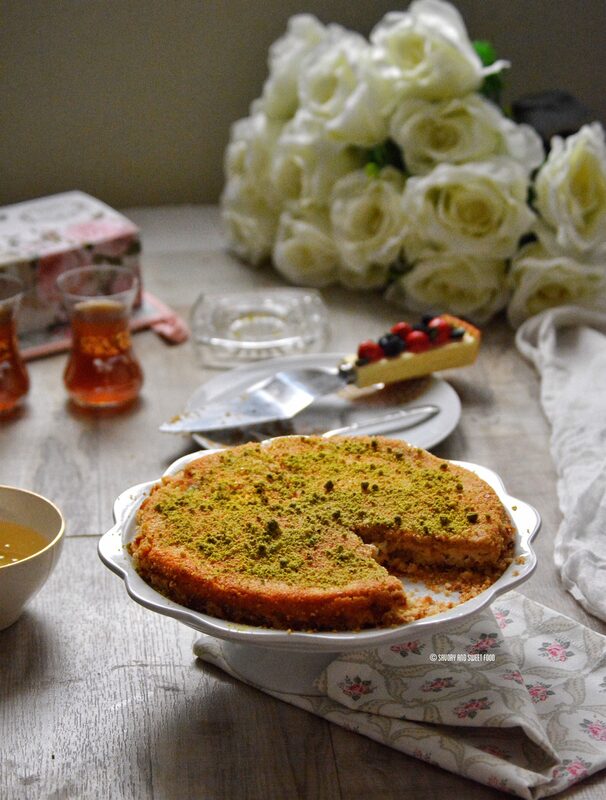 Beautiful pictures, and Bread Kanafa looks yummiliciously good!!! Assalamualikum. I made this yesterday and it was a big hit. Everyone enjoyed it. This recipe is a keeper. Thanks for sharing. Jazak Allah. Thank you. Please do give it a try. Can we do this on stove-top? Hey Flor! I have never tried it on stove top. 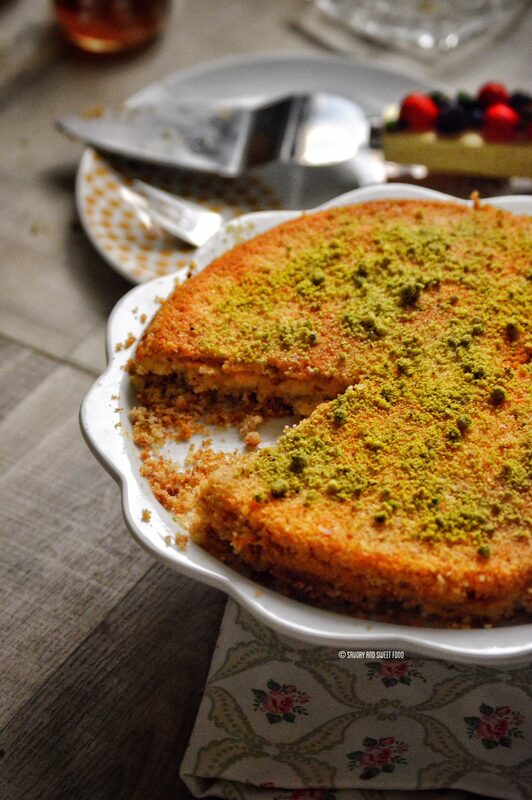 You can make it stove top, but flipping the knafa to make the top part crisp would be difficult. 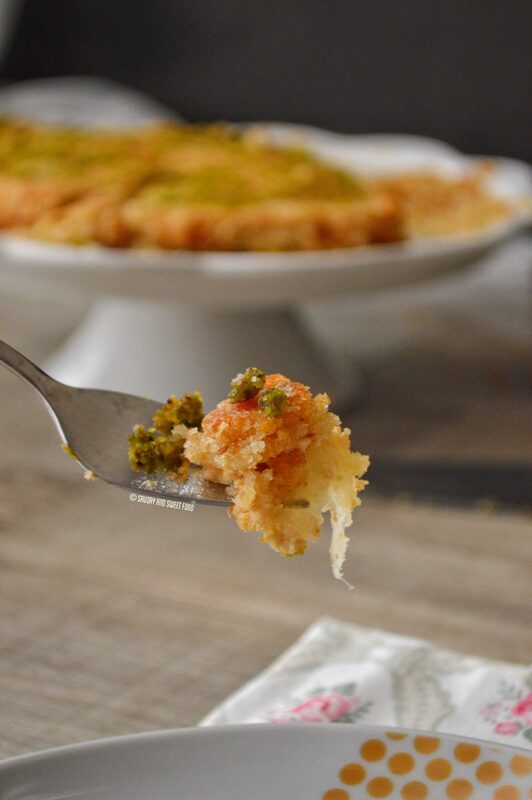 What you can do is make mini knafa in a small frying pan, then it can be flipped easily too. Hope this helped. Wa iyaki. so glad that you found this recipe useful. can i keep in fridge before serving? It would be best if baked few minutes before serving. I have an otg. Should i bake with lower rods heated or both (upper and lower) rods heated? Bake with both rods heated.